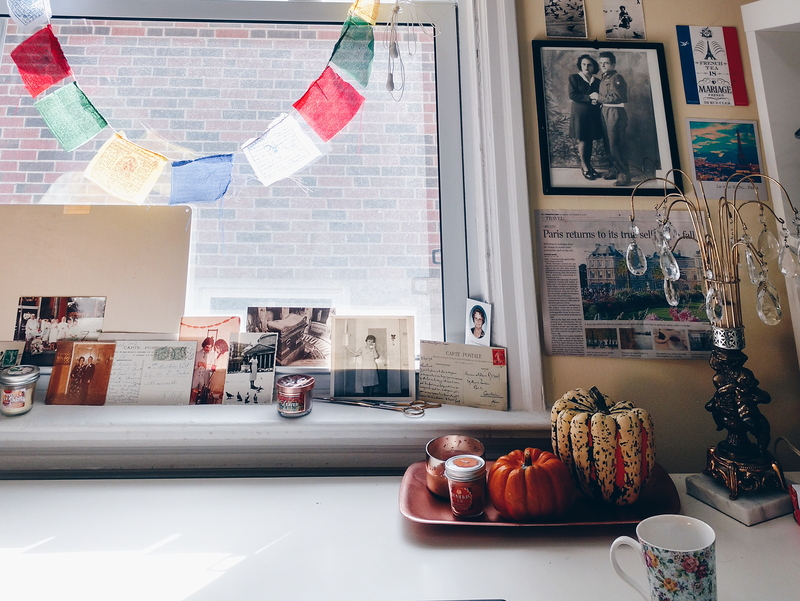 When I was re-arranging my office space into a more open, bright and welcoming layout, I also imagined that one day I would be focusing on an “inspiration board” or decorating the area around the desk in a way that inspires me as I work here. As a lifestyle blogger, my topics of focus can range, and as such, my inspiration is all over the place. I considered tearing photos of models out of magazines, but the idea of destroying magazines made me uncomfortable. The September issue of Vogue has a pull-out poster of Kendall Jenner but, while she is stunning, isn’t a particular inspiration of mine. I thought deeply about what, in particular, inspires me and my answers were clear: the things I love. 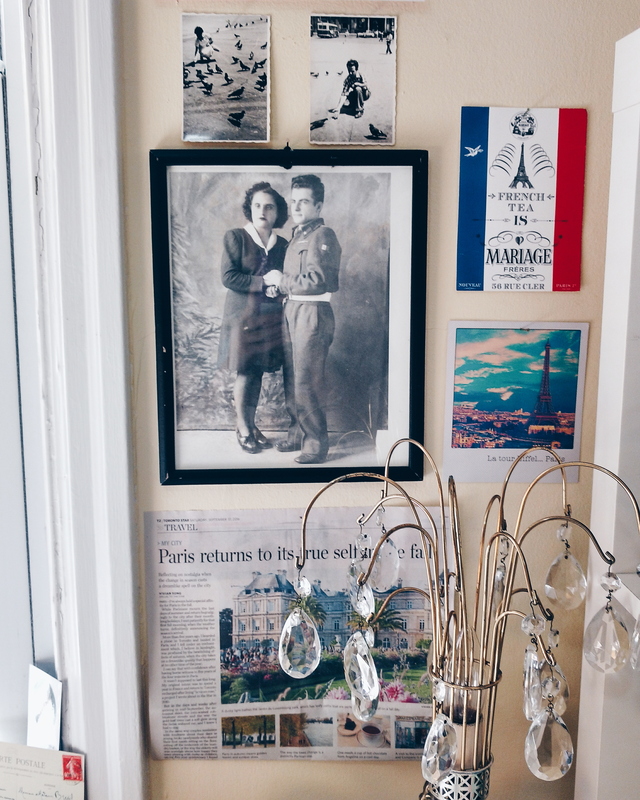 I would fill the space with the things I love: Paris, vintage things, my grandmother. My images of Paris are a reminder of my goals. It was the catalyst to creating this blog in the first place; my goal is to follow through with my dream of one day moving to Paris. 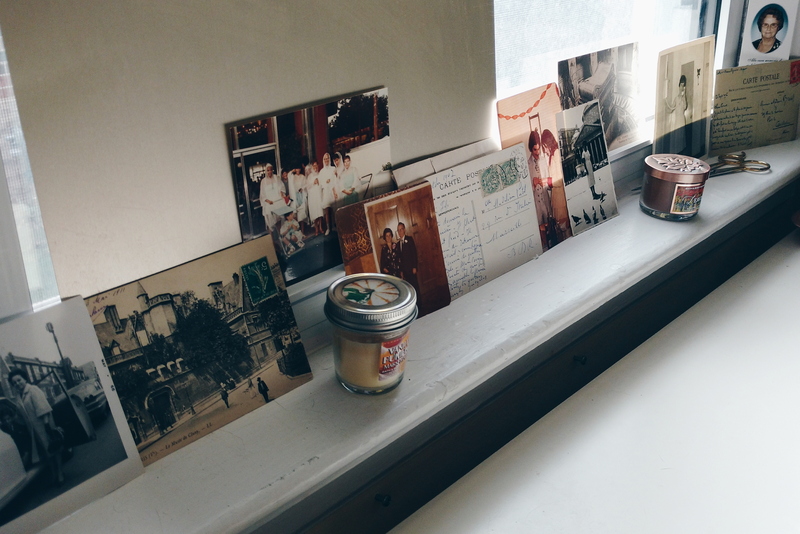 My reminders in this space are postcards I grabbed while in Paris this summer (new and old – the oldest being from 1908! ), as well as a newspaper clipping from a coworker about Paris in my favourite season. I added gourds to the space as a little homage to my favourite season, as well. My love of vintage and my love of my grandmother intersect. With her passing, I received many beautiful pictures of my grandmother and grandfather. These photos date from the early forties, onward. One particular image I got was a framed photo of my grandfather in his army clothing, posing with my grandmother, likely after one of the many military dances they attended. This particular frame hung in my grandmother’s room for as long as I can remember. My grandmother, despite not having a lot of money back in the day, always managed to be dressed in the most gorgeous clothes, with the most beautifully styled hair. These memories of my fashionable, young grandmother go hand-in-hand with a lot of what my blog focuses on; fashion and beauty, and making the most out of your outfit while spending as little as possible! As an educator on a teacher’s salary, I understand the desire to look good while still being cautious of your spending. My grandmother had the most beautiful dresses, wool coats, purses… all while taking the lead in supporting a family. My grandmother is also an inspiration for me for many other reasons, as I had mentioned in a previous post dedicated to her before her passing. She is a symbol of strength, resilience, and a symbol of a woman who worked hard to make a good life for her family. I don’t have children (by choice), but I am striving to make a good life for myself, and my small family of fur-babies and my partner, the love of my life. That doesn’t just include having a good paying salary, but it includes ensuring I am happy. My grandmother always used to say that if you aren’t happy, you have nothing. She is a reminder to follow those dreams and find that happiness. And, inserted among the ledge of photos is a photo of my parents at their engagement party. My parents have raised me to be a strong, independent, and hard working woman. Their photo is a reminder of that strength I have within myself, and it is also a reminder of where love can lead you. Humble beginnings can become great and beautiful stories, down the road. This room, this space in which I write, create, explore, in which my partner J also creates, learns, and works, has become quite an enjoyable space to be immersed in. I can’t forget the numerous book shelves I have in here which also reveal numerous ways in which inspiration can be found; through the mouths of the classics, the inspiring words of strong women, through the fantastical worlds of our favourite characters… Books are an endless way in which I discover and am inspired. So, what inspires you? 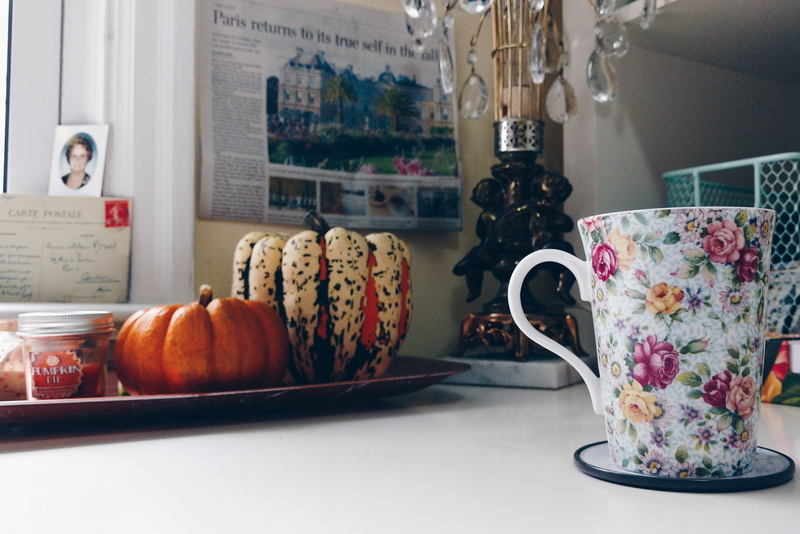 Have you re-made your space to help keep you on track with your goals? Show me a picture in the comments! Thank you so much! What inspires you? Oh yes, I love that too! But I don’t have the wood stove – I wish!